On this date in 1887 the New York based three-masted schooner Florence Shay, traveling from Savannah, GA, to Perth Amboy, NJ, with a $31,000 cargo of pine lumber, struck on Cape Lookout Shoals. The vessel foundered because of an "unshipt ruder" which resulted in about $3,000 worth of damage. The life savers managed to free the schooner. The crew were saved, and the cargo was undamaged. "Monday. 10 a m lookout reported that ther was Sch Heaing in with Signal Set as He neard found it was Sch with distress Signal Keeper crew lauch Surf boat Started to Sch it was blowing very fresh from NNW left Station 10 am arrived to Sch 12 am foung the Sch to Bee Sch Florence Shay from Savanah laden with pin lumber bound Bursamboy NJ Had Struck on lookout Shoals previce Night unshipt rudder manedg with sails to get Her Wee anchord Sead Sch off Hattress bar and cold not do better So Capt Sent messedg Ashore to Send for Steamer As was non Hen He cold. get lade at anchor untill to day Wee watch Her dilegently She was tode away to day By Bakers Selfredge Wrecking Co of Norfolk VA renderd all the assistance that wee cold Capt gave us meny thanks fo our timely assistance returned to Station 6 pm." Our latest Ocracoke Newsletter is the story of the Electrification of Ocracoke Island. You can read it here: http://www.villagecraftsmen.com/news022117.htm. The last Royal Governor of the Province of North Carolina was Lieutenant-Colonel Josiah Martin (1737 – 1786). 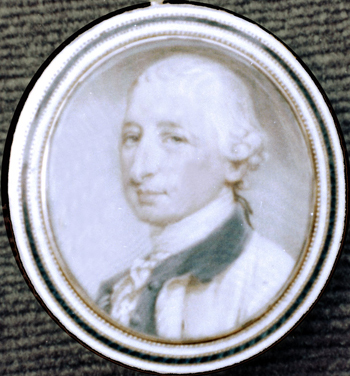 He served as Governor from 1771–1775. When the Revolutionary War erupted, Martin was living in New York City, although he still claimed to rule in North Carolina. In the winter of 1777-1778, the British having occupied Philadelphia, General George Washington went into winter quarters 23 miles west of Philadelphia, at Valley Forge. It was a severe and difficult winter, and supplies were running out. "Now the value of Ocracoke became still more apparent," explained Samuel A'Court Ashe in his History of North Carolina: From 1584 to 1783. In fact, Ocracoke Inlet had long been an important entry port for supplies to the Continental Army. Former Governor Josiah Martin penned the following Tory sentiments in January, 1778: "The contemptible Port of Ocracoke ... has become a great channel of supply to the Rebels....They have received through it and continued to receive at that inlet ... as lately as the beginning of this month very considerable importations of the necessaries they most want for the purpose of carrying on their Warfare from the Ports of France and the French West Indian Islands." "Ocracoke...on the north side of Ocracoke Inlet is a fishing village settled in the 17th century. Islanders in precarious houses, coast guardsmen, and sportsmen live peaceably here although there is no civil officer of the law. At the boat landing is a hotel, a frame structure built around three sides of a sandy courtyard. Infrequent hurricanes, hardly one in a decade, strike with great force. The village was inundated in the storm of 1933." 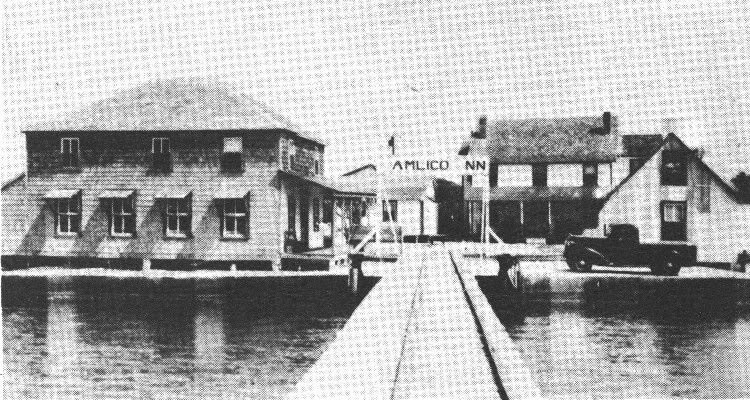 The Pamlico Inn, referred to above, was destroyed beyond repair in the 1944 hurricane. Early in July, the former Moore and McCormick liner Algorab was making ready to sail for the Azores after European War refugees. Coastguardsmen were needed to operate the landing boats; a call was issued for volunteers at the Norfolk base. Lum Gaskill, Jr. [Ocracoke Island native] was the only Tarheel coastguardsman to volunteer to make the cruise which started on July 6 and terminated August 16, resulting in the transfer of 512 refugees to the United States. Later Gaskill was transferred to Little Creek, C.G. Station at Cape Henry. On Sept. 6, two months after the cruise of the Algorab began, Coastguardsman Gaskill and the former Miss Daisy Styron of Ocracoke were married in Norfolk. She is making her home here, where her husband visited her last week for a few days. Ambassador Josephus Daniels, home on vacation from the American Embassy in Mexico City, has accepted an invitation from the Hyde Co. Board of Commissioners and Southern Albemarle Association to speak at the annual meeting in Swan Quarter on Thursday, October 23. 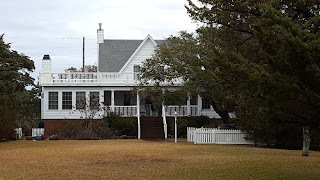 The ambassador spent 2 of his boyhood years on Ocracoke Island during the War Between the States and his brother, the late Judge Frank Daniels, was born here. The Daniels' island home was in the house which Capt. W.G. Willis lived in here for many years, which is now located just back of his new and modern home near his wharf on the north side of Silver Lake. Of 4,318 dealers issued licenses to sell beer in 98 North Carolina counties, there are only 6 in Hyde County, none of which are located on Ocracoke, where it's sale was outlawed several years ago. Many events have impacted Ocracoke and the Outer Banks. An 1846 hurricane opened the more-navigable Hatteras Inlet, thus diverting shipping away from Ocracoke. Union occupation of the Outer Banks in 1861 caused many islanders to flee, and the establishment of an ice plant on Ocracoke in 1938 helped energize commercial fishing. Other storms, wars, and "man-made" changes have had enormous consequences. 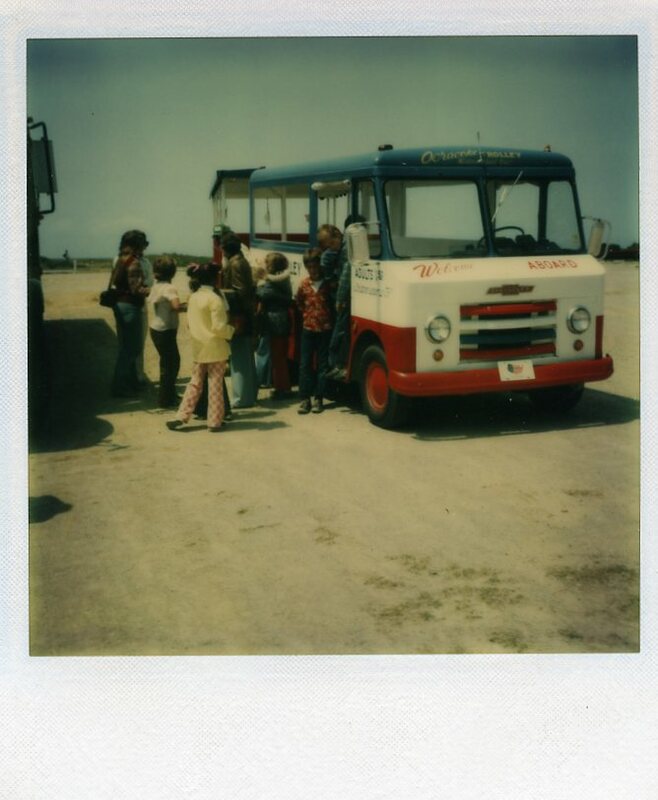 In September, 1969, a quieter, less dramatic event helped propel Ocracoke towards becoming a major tourist destination. Starting on page 393 of National Geographic (September, 1969), author William S. Ellis and photographer Emory Kristof devoted 29 pages documenting the appeal of the Outer Banks with history, stories, and stunning photos. Three elements of the article stand out: a two-page aerial photograph of Ocracoke Village, a three-page map locating Outer Banks shipwrecks, and the dramatic, space-eye image of the Outer Banks made by the crew of Apollo 9. 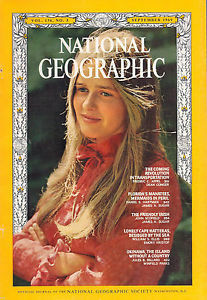 This issue of National Geographic is available numerous places on-line, and can often be found in antique stores and thrift shops. 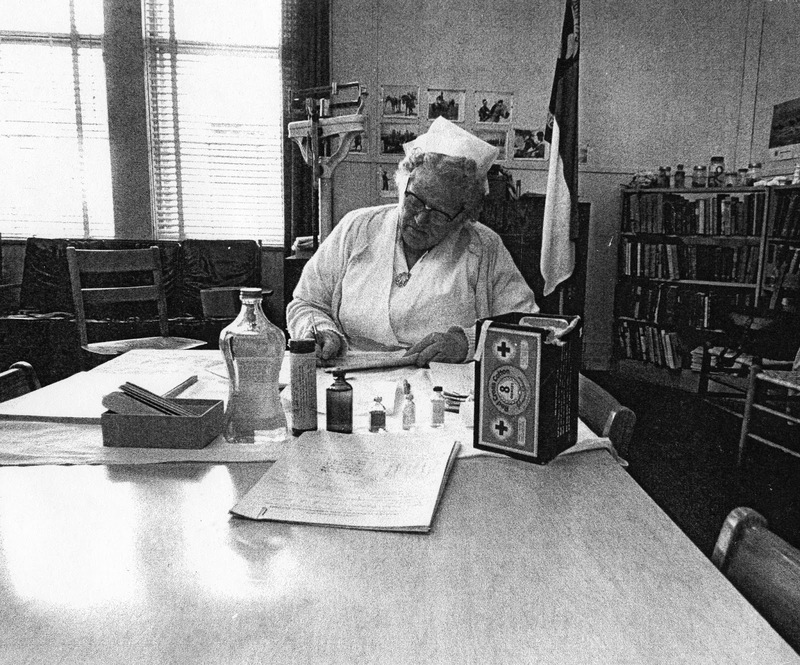 "Miss Kathleen Bragg, R.N., retired in February after twenty-five years of service as Ocracoke School Nurse under the Hyde County Health Service. She graduated from the Parkview Hospital in Rocky Mount in 1925 and thereafter followed her profession of nursing in various places all the way from Jacksonville, Fla., to Hatteras. She returned home to care for her father, who died in 1938, and afterward for her mother, who died in 1971. She was appointed Ocracoke School nurse in 1949 and served in weekly contacts with the school children in permanent health record-keeping for them. "During this time she continued her private practice at Ocracoke and she prepared for and worked in the various clinics which the County Health Service conducted. These included an annual check-up of pre-school and other students, an eye-clinic, a blood-test clinic and other special work, among adults as well as children. 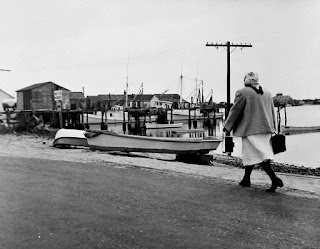 "Dr. Johnson, of the Hyde and Dare County units, now retired, officiated with Mrs. Sybil Bouchard, R.N., in charge of the Hyde County Department and Mrs. Charlie Cahoon, recording secretary, served also at the clinics, with mainland doctors who made special trips to Ocracoke. 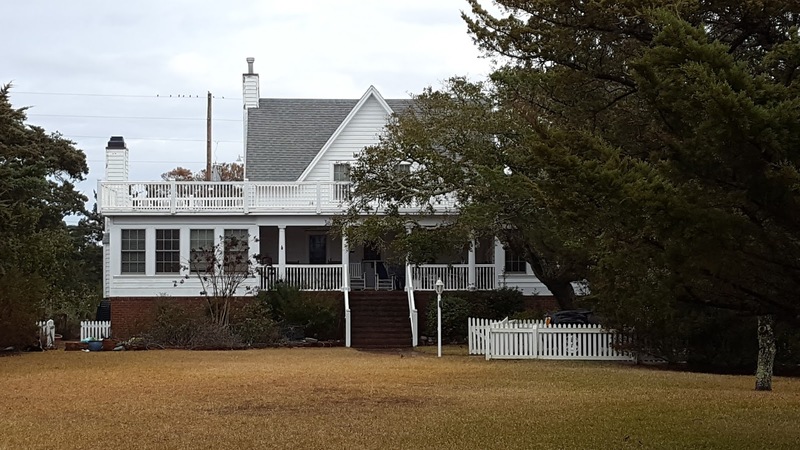 "Miss Bragg lived at her home here during the years when not only did Ocracoke have no resident doctor, but there was no one available, and it was she who served as doctor, as well as nurse, at the birth of many Ocracoke children now grown to adulthood. "The Hatteras Clinic and its resident doctor has relieved this responsibility for Ocracoke but high winds and high tides have prevented expectant mothers from getting to their doctor, and babies have arrived in emergency situations in strange places. In 1963 little Andy S. O'Neal was born in a C.G. helicopter 810 feet above Camden, and as late as 1971 Dr. Burroughs of Hatteras Medical Center, was brought by amphibious U.S.C.G. Larc to officiate at the birth of Beverly Williams, on the C.G. boat, prevented by high winds and low tides from getting from the Ocracoke to the Hatteras side of the Inlet. Weather emergencies will always be an emergency factor from time to time on Ocracoke Island." Visitors to Ocracoke often wonder how we get electricity to the island. Power first came to Ocracoke in 1936 when Stanley Wahab housed a salvaged generator in his hotel. The island continued to rely on locally produced generator power until 1966, when electric cables were attached to the Oregon Inlet bridge and laid under Hatteras Inlet. Today we rely on power generated in Virginia for normal usage, and we also have a four million dollar generator on site for use in emergencies. We also have a newly installed microgrid of solar panels and Tesla batteries. 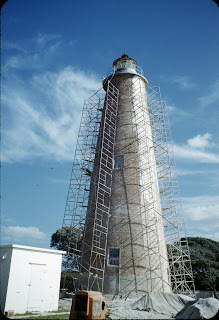 To read more about the electrification of Ocracoke Island follow this link to our latest Ocracoke Newsletter: http://www.villagecraftsmen.com/news022117.htm. Native islander, Kathleen Bragg (1899-1975), was the daughter and granddaughter of Ocracoke Inlet pilots. In 1925 Kathleen graduated from the nursing school at Rocky Mount Hospital, and returned home to care for her family and neighbors. In those days there was no resident doctor on the island. In addition to caring for the island's sick and infirm, Kathleen also delivered more than 100 babies. 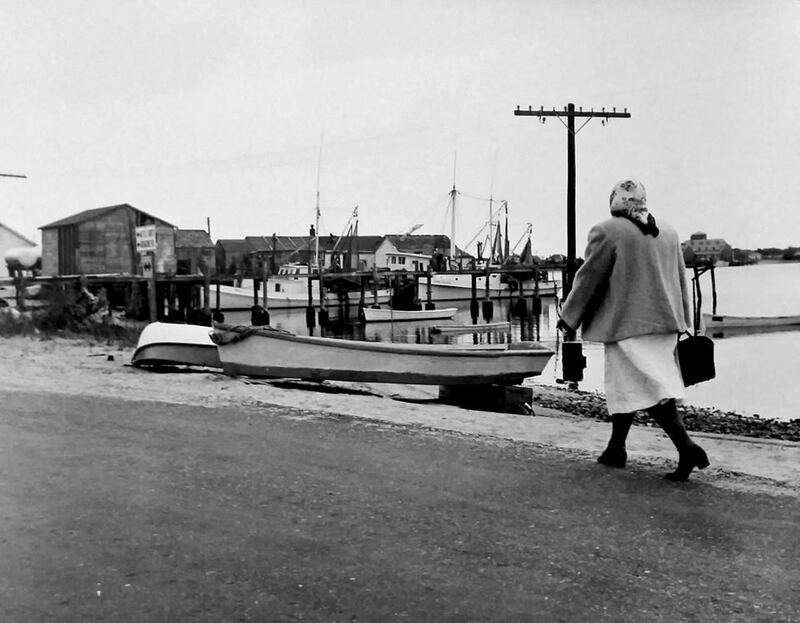 In 1953 Kathleen began working as the Ocracoke School nurse. She spent Wednesdays at the school, often administering vaccine injections. As Alton Ballance writes in his book, Ocracokers, "high absenteeism was not uncommon on Wednesdays." You can read more about Kathleen here: http://www.ocracokecurrent.com/86202. Our latest Ocracoke Newsletter is Ellen Marie Cloud's first-person account of the Great Ocracoke Lighthouse Window Heist. You can read it here: http://www.villagecraftsmen.com/news012117.htm. James (1839-1904) and Zilphia Williams (1841-1919) Howard had twelve children, eight of whom (Annie, Cordelia, Elsie, Florence, William, Edith, Stacy, & Thomas) died very young. The eight unfortunate children are buried along Howard Street. Each of the four headstones has one child's name on one side, and another child's name on the other side. Eight footstones, with initials, lie between the dual graves. Lorena (1866-1897), Homer (1868-1947), Sabra (1870-1951), and Wheeler (1874-1940) survived to maturity. 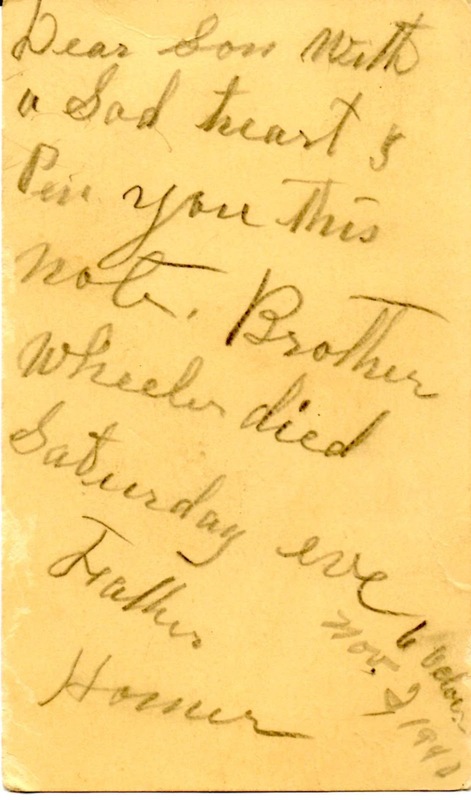 In 1940 Homer sent a postcard to his son, Lawton (who was living off the island), explaining that his brother Wheeler had just died. 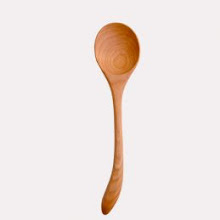 The postcard reads, "Dear Son With a Sad heart I Pen you this note. 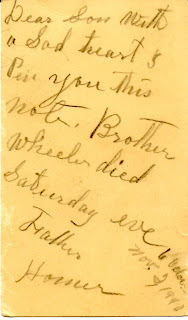 Brother Wheeler died Saturday eve, Father Homer Nov. 2, 1940"
Before Ocracoke had a modern Health Clinic with a resident doctor, and before islanders had easy access to professional undertakers, death was a frequent companion that Ocracoke residents dealt with regularly. They coped as best they could. The Gaskins-O'Neal House on Howard Street was built ca. 1883. It is a traditional "story-and-a-jump" house, and still retains its original wide, single shoulder chimney and original rear shed. The front gabled dormers may have been added at a later date. The 1883 deed for this property, owned at one time by Solomon Howard (1807-1853), to William W. Gaskins (1841-1916) mentions buildings on the property. However, oral history indicates that the current house was built for William Gaskins. The original buildings were probably demolished before Gaskins built this house about 1883. Stanley O'Neal (1885-1956) and his wife Mozelle later owned the property. You can read more about Stanley O'Neal here. Several years ago I wrote about Ocracoke's homemade meal wine. "Corn meal wine, now there was a concoction that had a kick like an eight gauge shot gun when fired. Without giving the formula, let's just say it was made from corn meal, sugar and yeast cakes, and set in the sun for fermenting. After three days it was drawn off and bottled. It was now drinkable, and the longer it sat the more potent it became. One old fellow used to say that three glasses full would make anyone fight a circular saw. What a revelry often happened, and sometimes a few fist fights, too." Ocracoke didn't always have easy access to fresh milk and vegetables. In his book, Pieces of Eight, Coins, and Ocracoke, Paul Mosher relates stories of vacationing on Ocracoke in the early 20th century. In the late 1920s Paul writes that he "was a tourist at the time in a summer cottage (Hurricane House) down point.... I would go to [Mr. & Mrs. Amasa (Mace) Fulcher's] kitchen every day to get two quarts of fresh milk. This was before the days of homogenized milk, and the richest cream would rise to the top. We [had] contracted with Mr. Mace to buy, during our summer stay, all his surplus milk if he would import a milk cow. In the fall he could always butcher the cow. The locals dearly loved their coffee, and this cream beat Carnation milk all hollow." Today you can buy milk, cream, and half-and-half at several local stores. 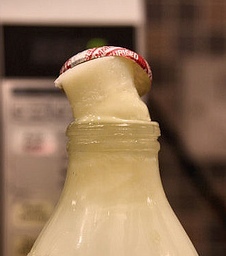 But the cream that rose to the top of fresh unhomogenized milk was the best! 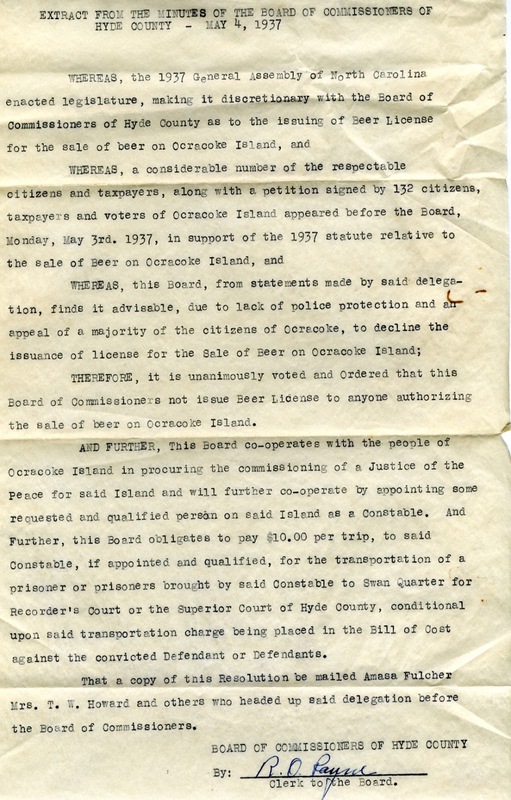 In 1715 the North Carolina Colonial Assembly enacted a statute to establish pilots at Ocracoke Inlet. Masters of sailing vessels needed pilots with local knowledge to guide their ships through the inlet, across the bar, and into the ever-changing channels that led to deeper water in Pamlico Sound, and from there to mainland ports, in the vicinity of which four-fifths of the colony's residents were living. In spite of the 1715 legislation, pilots of record do not appear until almost two decades later. In 1731 the Governor of North Carolina, George Burrington, wrote that other North Carolina inlets had become so dangerous that most sailing vessels were forced to use Ocracoke Inlet. 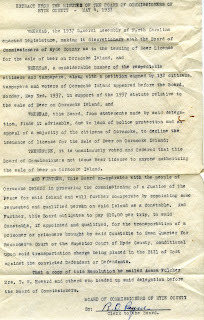 In 1734 Miles Gale became the first captain to make a formal request to be appointed as a pilot at Ocracoke Inlet (however, see http://villagecraftsmen.blogspot.com/2016/10/patsey-caraway.html for more information about an early Ocracoke Inlet pilot). 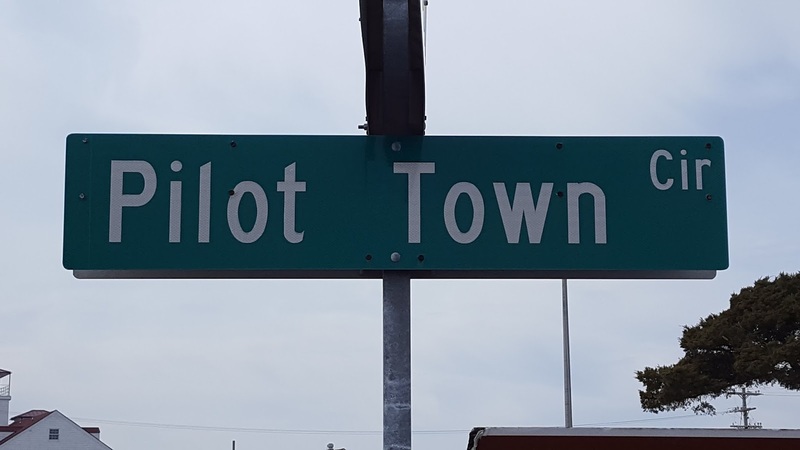 For many years Ocracoke Inlet pilots then played an important role in the history of eastern North Carolina. In addition to providing safe passage to mainland ports, the pilots were required to notify port commissioners of incoming vessels carrying persons afflicted with contagious diseases. A Frenchman, Pierre Auguste [Augustus] Cabarrus (1758-1819), is also known to have been a pilot during the early period (See our July, 2016, Ocracoke Newsletter). As I write, Ocracoke is home to two coffee shops. 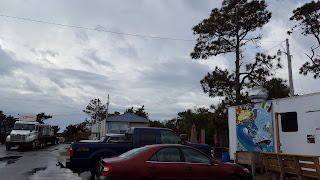 The Ocracoke Coffee Company, located on the Back Road, has been a popular destination for visitors and locals for a number of years, offering coffee, smoothies, and breakfast fare. The Magic Bean Coffee Shop, on School Road, opened in 2015, serving organic fair trade coffee, smoothies, and muffins. 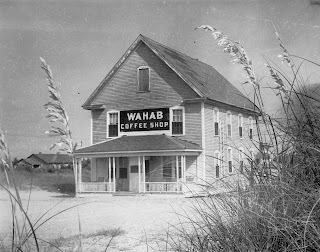 In the 1940s Ocracoke native, Stanley Wahab, opened Ocracoke's first Coffee Shop. It was a popular local attraction for a number of years. 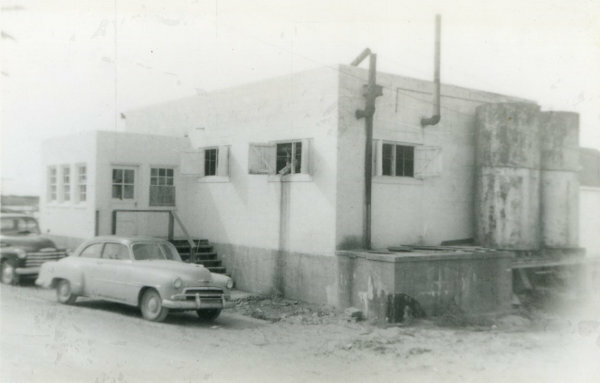 I am wondering if any of our readers can identify the building that housed the island's first coffee shop. If so, please leave a comment. If you enlarge the photo you can clearly see where the stucco has been removed to expose the red bricks on the windows side. I learn something new every day! The solid brick walls are 5 feet thick at the bottom, and 2 feet thick at the top. Below is a current photo of where the Trolley Stop One structure once stood (see our post for yesterday, Monday, February 6, 2017). Eduardo's is the building visible in the bottom right of this photo. 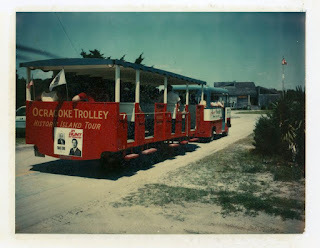 The Trolley (first a roofed, open-sided wagon pulled by a truck, later a step van) offered tours of the village starting in about 1976. The building in yesterday's photo served as ticket office and ice cream stand. In about 1978 the ticket office was moved beside the bank, expanded, and operated as ticket office and a "hamburger & ice cream" self-serve restaurant. Today it serves as the location for Ju-Jitsu instruction, behind Native Seafood. 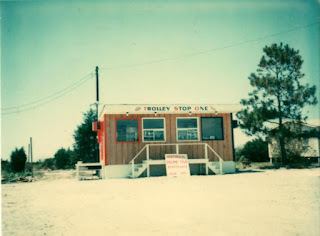 Photos below are from the Billy Eley Collection at the Ocracoke Preservation Museum. Our third, and final, photo quiz is this picture of Trolley Stop One. 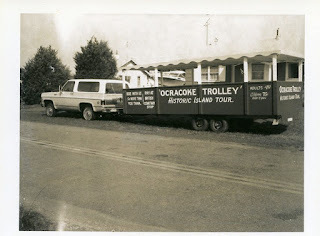 I wonder how many of our readers remember the Ocracoke Trolley, and know where this structure was located. Also, do you know who operated the Trolley, and when? If you do, please leave a comment. I will post more information tomorrow. 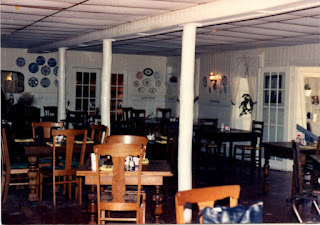 The photo in yesterday's post was of the Island Inn dining room. Below is a current picture of the Inn. I was not able to take a photo of the dining room because the Inn is closed. Today the Island Inn, one of the most prominent historic structures in the village, is for sale. The center 2-story section of the Inn was built in 1901 as the Odd Fellows Lodge, on land purchased from James and Zilphia Howard. It originally sat on the other side of Lighthouse Road, and was moved in the 1920s. In addition to serving as a fraternal lodge, the building has been used as a private dwelling, the island's first public school, a coffee shop, and a naval officers club. 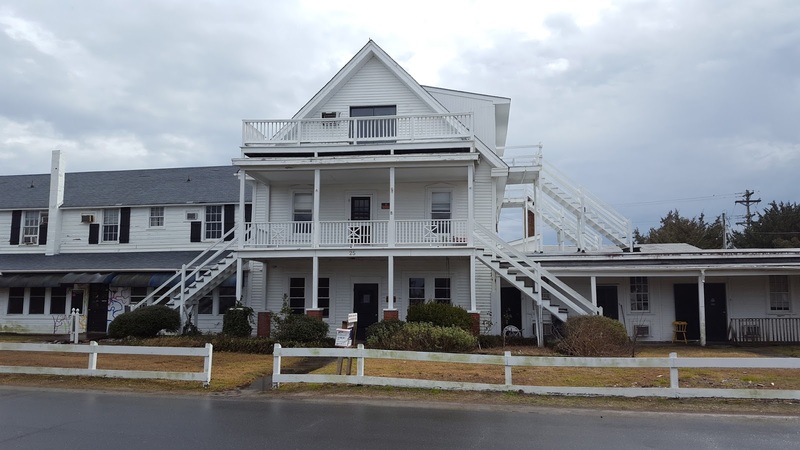 Although many islanders are concerned about the future of the Island Inn, to my knowledge no individuals or non-profit organizations have sufficient funds to purchase and rehabilitate the aging structure. Perhaps one of our readers will be motivated to restore the Inn to its former prominence. For more information click here. Below is a photo of the dining room of a popular island restaurant from the 1980s. If you can identify the restaurant and/or have stories you would like to share about dining there or working in this restaurant, please leave a comment. I talked with the former manager of the restaurant several days ago. We laughed about all the pranks and shenanigans that went on in the kitchen! The house in yesterday's photo is the James Hatton Wahab house. Below is a photograph I made a few days ago. This 1 1/2 story central gabled house was built ca. 1886. The columned stoop and porches visible in yesterday's photo were added in 1936-1937. The house was raised, additional rooms added, and the porches expanded around the turn of the 21st century. This house was originally built for James Hatton Wahab (1861-1915) and his wife Martha Ann Howard Wahab (1867-1949). James Hatton was a notable islander who served in the US Life-Saving Service. 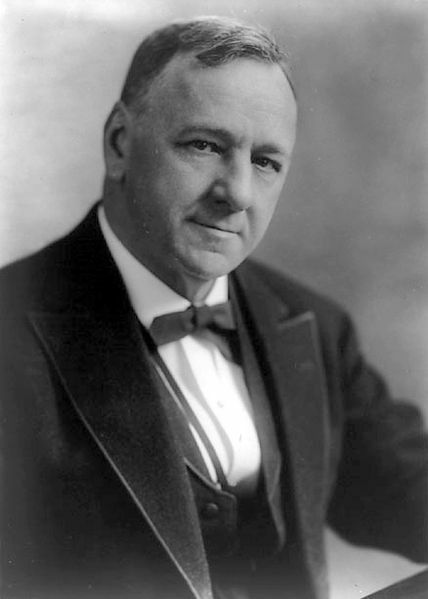 Hatton and Martha Ann's son, Robert Stanley Wahab (1888-1967), continued to live in the house. 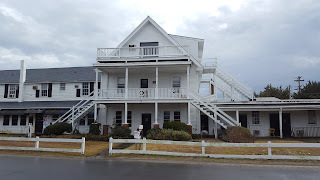 Stanley established and operated the island's first ice and electric plant, began the Wahab Village and Wahab Hotel (now Blackbeard's Lodge), and turned the former Odd Fellows Lodge building into an inn that was the forerunner of today's Island Inn. 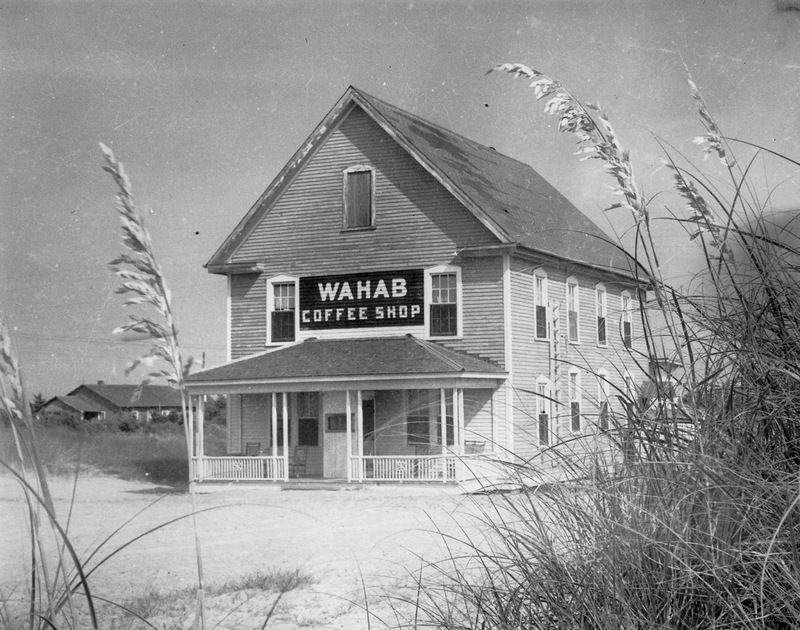 Stanley Wahab was one of Ocracoke's first native entrepreneurs and one of the first to envision the island's tourist potential. Stanley's widow, Myra Wahab (1903-2002), lived in the house until her death. Stanley's nephew, Chip Stevens, owner of Blackbeard's Lodge, and his family live there today.